Facts, information and pictures for Sea Lions. The Steller sea lion (please check out our sea lion pictures) is the largest member of the Otariidae (eared seal) family. 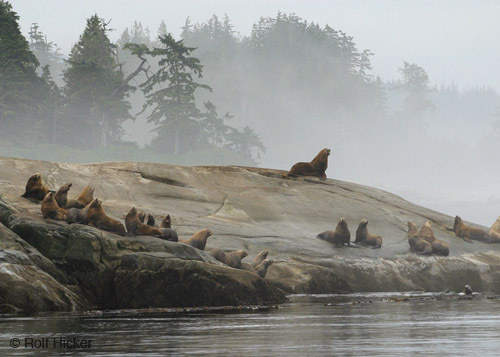 Steller's sea lions inhabit the cooler waters of the North Pacific. They are divided into two stocks - the western population (Gulf of Alaska, Bering Sea, Russia and Japan), and the eastern population (California, British Columbia and south east Alaska). This species gets its name from a German naturalist named George Wilhelm Steller who was the first to study the animal in 1742. Steller's sea lions are suffering massive, inexplicable population losses and are listed as endangered. Steller’s sea lions are marine mammals and members of the suborder Pinnipedia (which in Latin means “fin-footed”). Male Steller’s sea lions average 907 kg (2,000 lbs) in weight and 3 m (10 ft) in length; females average 272 kg (600 lbs) and 2.1m (7 ft) in length. When dry, Steller’s have very thick, yellowish-brown fur but appear darker when wet. Mature males develop a heavy muscular neck with a mane of long, coarse hair. Steller sea lion pups are black in color and weigh from 18 – 22kg (40 - 48.5 lbs) and are about 1 m (3.3 ft) in length. Pups are dark brown to black until 4 to 6 months old when they molt to a lighter brown. By the end of their second year, pups have taken on the same pelage color as adults. Bulls become mature between 3 and 8 years of age, but typically are not massive enough to hold territory successfully until 9 or 10 years old. Females reproduce for the first time at 4 to 6 years of age, bearing at most a single pup each year. Eared seals are able to control their hind flippers independently, allowing them to be particularly agile on land and, unlike the true seals, they swim using their foreflippers . 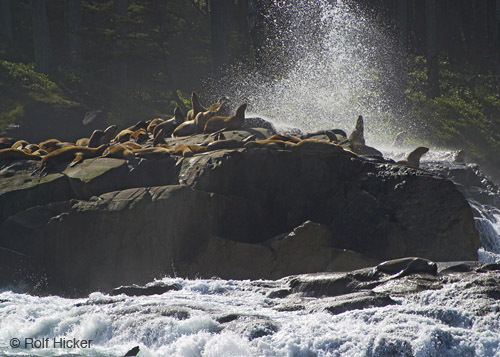 Steller sea lions are opportunistic predators, feeding primarily of a wide variety of fishes and cephalopods. Prey varies geographically and seasonally, however, it is known that they feed near the shore on squid, octopus and fish, such as herring, mackerel and salmon. Steller sea lions have been known to prey on harbour seal, fur seal, ringed seal, and possibly sea otter pups, but this would represent only a supplemental component to the diet. . In spring, Steller’s gather at breeding areas called “rookeries”. Males arrive in May, staking out territories before the females come ashore. When the females arrive, they are herded into a bull’s territory to form a “harem” – a loosely connected group of 15 or more females. Soon after they arrive, females give birth to a pup conceived the previous year. year’s pups). Gestation lasts 10 –11 months. In August, the males leave the rookeries, followed in a few months by the females. migrate as far south as Baja California, and Mexico. to compete with mature adult males for a territory. Males are polygamous and territorial on land. They defend the boundaries of their territories with ritual threat displays to other males.